If you’re after a 4K TV with cinematic flair, a curved set could be just the box office ticket. It’s a form factor Samsung has long championed. As a bonus, the QE55Q8C puts the bend into a high performance QLED panel. Not to be confused with OLED, QLED is a variation on Quantum Dot technology, which offers improved colour fidelity and off-angle viewing with LED LCD TVs. Samsung may be the only major TV brand still hawking curved screens, but the Q8C is undeniably a head turner. If you want a telly that’ll look good in a bright viewing environment, it’s also got the backlight brightness to oblige. Slick and contemporary sum up this set’s dress sense. The black and silver frame is classy, while the central stand is eminently practical. The quality of finish is high; even the rear panel has a metallic finish. Connectivity is off-loaded to Samsung’s discrete One Connect junction box. This accommodates four HDMIs, a trio of USBs and an Ethernet connection. The One Connect box routes AV to the TV via a single cable, which keeps things nice and tidy. The set itself still needs its own power lead though. 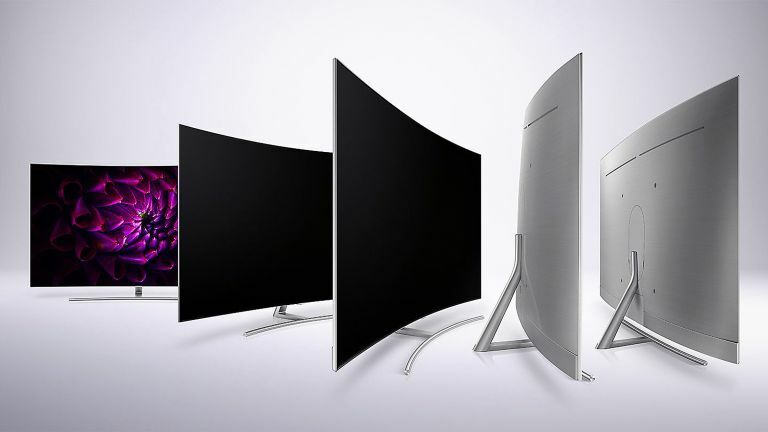 The Samsung QE55Q8C is positioned between Samsung’s Q7F and Q9F ranges and comes in 55-, 65- and 75- inch screen sizes. Their full names respectively, then, are Samsung QE65Q8C and Samsung QE75Q8C. Despite its various functional niceties, the key attraction of the Q8C remains its QLED panel technology. A refinement on Quantum Dot filtering, which has been around for some time, it’s key attraction is that it offers wide, deep colour and high brightness. HDR support covers everyday HDR10 and broadcast HLG HDR. The screen is also compatible with the dynamic metadata standard HDR10+, a rival of sorts to Dolby Vision. It remains to be seen if HDR10+ gains wide traction with content suppliers (being an open standard, expectations are high). Let’s hope so, as there’s no support for DolbyVision. The Standard image preset is our go-to viewing mode for most content. It offers a high average picture level, while retaining balance and depth. The set’s inherent brightness comes into its own in brightly lit spaces. It really cuts through with colour and contrast. The Q8C is tailor made for daytime viewing. For regular SDR (Standard Dynamic Range) content, there’s an upscale mode dubbed HDR+ . This ramps up brightness and colour vibrancy, although some might feel the end result is overwrought and oversaturated. It’s ultimately a matter of taste. Peak brightness with genuine HDR sources is very high - upwards of 1500 nits. The curved screen favours square-on and direct, close viewing. The curve can throw up odd reflections though, and when viewed off axis tends to look wonky with onscreen EPGs. To help fine tune motion handling, a Custom setting individually tailors judder and blur. Keep both low and you’ll get an acceptable performance for fast moving sports. If you don’t like the kind of soap opera effect you get from image interpolation, motion processing should be turned off. Audio provision is perfectly fine, although we suspect buyers might ultimately want to partner this set with a matching Samsung curved soundbar. Smart functionality is good, if not class leading. Samsung’s Eden interface is easy to navigate and supports a range of catch-up services, including BBC iPlayer, ITV Player, All 4 and My5. This icon-based interface allows users to customise which apps and sources appear on the Home screen. All key third party streaming services are onboard, and both Netflix and Amazon Prime Video support 4K and HDR streams. However there’s no support for Freeview Play, which has become ubiquitous on rival up-market connected 4K TVs. It’s disappointing that Samsung continues to snub Freeview Play (it’s now the only major TV brand holding out against this connected update to subscription free TV) , but at least all the main TV catch-up players are provided. The Q8C comes with two remotes, a Bluetooth zapper with voice integration, and regular wand. The TV supports Wi-Fi and Bluetooth connectivity. Once online, it’s compatible with networked DLNA devices, and will play files from NAS and USB devices. You can also timeshift from the set’s tuner onto a USB hard drive. This Q8C is currently available for around £1,299, which represents a significant saving on its £1,699 launch price. While there are 55-inch flatscreen UHD models available for less, they tend not to have the impact or HDR chops of Samsung’s QLED technology. It’s a good value buy. If your three tick boxes are (1) QLED, (2) HDR and (3) curved, then Samsung QE55Q8C is an easy recommendation. That aside, it’s a superior 4K HDR LED TV that’s particularly suited for daytime and bright room viewing.